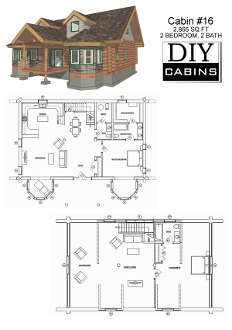 Log Cabin #16 is an 2,865 sq ft cabin with 2 bedrooms and 2 bathrooms. This 2 bedroom cabin has it all: A comfortable master bedroom, sitting area and private master bath with walk in closets. A large second bedroom with a bath. A large living room and seperate family room. Dining room and seperate sitting area. The 3 dormers (2 gable dormers and 1 shed dormer) offers a lot of open space on the second floor.